SCVHistory.com LW2732 | People | Crypt of Mark T. Gates Sr., Founder, Eternal Valley Memorial Park. Crypt of Mark T. Gates Sr.
Crypt of Mark T. Gates Sr. and Margaret Gates, located inside the mausoleum at Eternal Valley Memorial Park in Newhall. Mark T. Gates Sr. founded Eternal Valley on Feb. 5, 1958, after his father-and-son company — Gates, Kingsley and Gates Funeral Directors of Santa Monica — purchased the 750-acre Needham Ranch from the heirs of Newhall prohibitionist Henry Clay Needham in 1957. The cemetery was established on a 220-acre section of the property that included the old Pioneer Cemetery, dating to the time of Sanford Lyon and the Lyon's Station stagecoach stop. Born Dec. 29, 1907, in Nebraska, Mark T. Gates Sr. served as mayor of Santa Monica from March 1947 to April 17, 1951. He was the first mayor elected after charter reform switched the city to a council-manager form of government. Previously, the city was run by three elected commissioners. He died July 12, 1972, at which time his company sold the Eternal Valley property but retained 584 acres of the ex-Needham Ranch. 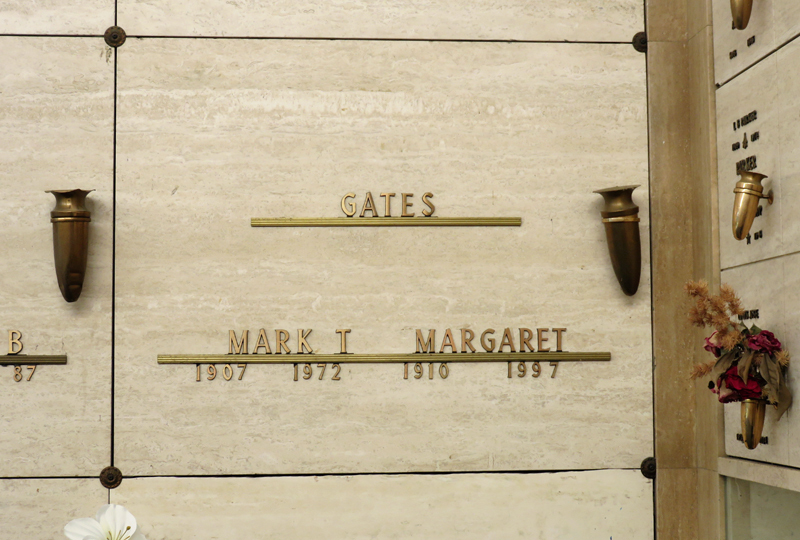 Mark Sr.'s wife, Margaret Gates (1910-1997), is interred with him. As of 2014 their son, Mark Gates Jr., together with the cemetery owner and another adjacent property owner, are preparing to develop the remaining ex-Needham Ranch property into a business park. Approved development plans call for the wooded, riparian southern portion of the property to be deeded to the city of Santa Clarita as open-space parkland. Update: Construction of the Gate-King Industrial Park at Needham Ranch started in the fall of 2017. The 240 acres of open space had been donated to the city by that time. LW2732: 19200 dpi jpeg from digital photograph Oct. 20, 2014, by Leon Worden.